Built 1899 by Arizona Charlie Meadows. Opened July 1899. Rebuilt mostly to the original plans in the 1960s. Home to the vaudeville "Gaslight Follies" for more than 35 years until 2003. 2016 renovations. 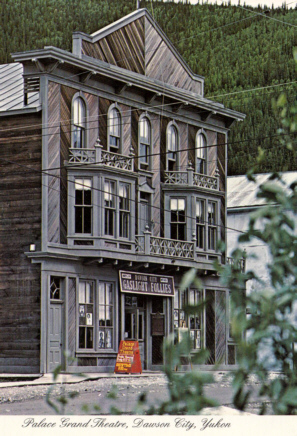 Reverse Text: "Palace Grand Theatre - Restored Palace Grand Theatre is a pupular attraction in Dawson City"